Ein Gwlad is a new Welsh political party that launched over the summer, with the aim of reenergising politics in Wales. This book looks at first glance like a party manifesto, or at least an explainer as to what this new political party stands for. As someone who had followed the party’s development online but wasn’t sure what they were trying to achieve or whether it was worth paying attention to them at all, I was intrigued. Much of the online discussion about Ein Gwlad has centred on what the party isn’t rather than what it is – ‘It’s not a right-wing party’, its adherents tell us, but one that has a ‘syncretic ideology’. A quick read of this book reveals that what this essentially means is that Ein Gwlad is a Welsh populist party, of the kind that have won electoral success all over the western world in the last few years. And like others in Europe, the party seeks to combine some ideas from the left, such as a Citizen’s Income, with a conservative line on issues such as culture and immigration. The arguments sketched out by Aled Gwyn Jôb in this book will be familiar to anyone who has studied populist movements in any detail. Reassert the primacy of the nation, Wales, over distant and unaccountable international organisations, in this case Westminster and the EU. The discourse employed in this book is very much in the populist mould. Politics is portrayed as a battle between the working-class people vs the ‘ruling metropolitan liberal technocratic elite’ and ‘authoritarian left PC language police’. Plaid Cymru, the author says, are a nationalist party that have completely lost sight of what’s best for the nation they represent, instead becoming part of the elite they should be fighting. There is also a suggestion that the media need to be “cut down to size”. The party refuse to invite the media to their own launch, preferring instead to communicate directly with the people via social media. But this is, of course, not a review of Ein Gwlad but rather a review of the book. And despite revealing a lot about the party this isn’t just a manifesto as the title suggests. 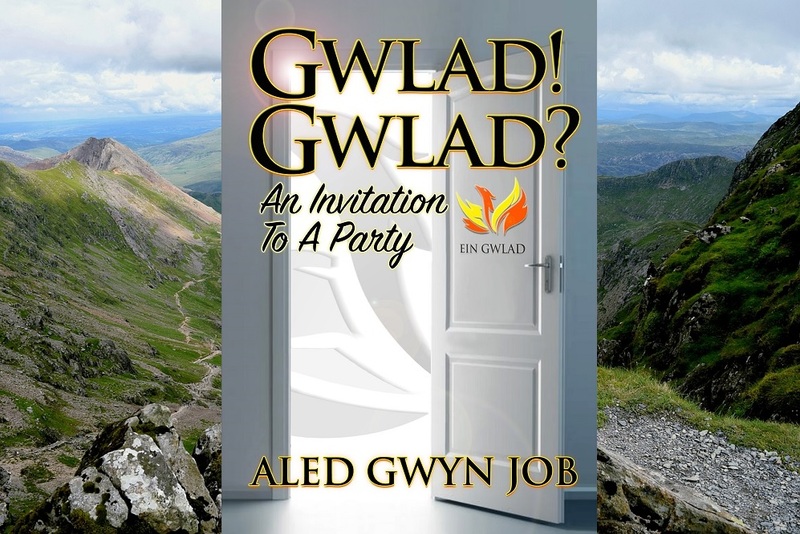 It is just as much a book about the author, Aled Gwyn Jôb, and his thoughts about physical and mental health, love, and religion, as it is about Ein Gwlad. It is also a remarkably candid, warts and all account of the setting up of a new political party, as well as the political tumult of the past few months. It includes several very interesting conversations with people who may or may not have realised that Aled was going to write everything they said in his book. We get to hear what now-independent AM Neil McEvoy really thinks of the Plaid Cymru group at the Assembly, as well as a detailed account of what the falling out within YesCymru over the summer was all about. As someone with a great interest in Welsh politics, I found it surprisingly engaging. Although I’m not sure it would appeal to anyone who doesn’t already know half the ‘characters’ involved. Quite surprisingly, as their communications officer, Aled doesn’t have much interest in presenting Ein Gwlad in the best possible light. Every querulous argument between the men involved (and they are all men, until the very end) is catalogued in frank detail, and as a result, the book is very funny at times, although I’m not sure if it is always intentionally so. The endless arguments between the Alpha Males on the Steering Committee were, Aled tells us “like two stags on some windswept heath, horns locked together in mortal combat”. What does leave a bad taste in the mouth, however, are the opinions on women’s equality voiced throughout by some of those involved in the party, as well as the author himself. Aled himself mutters darkly about the Me Too movement throughout, accusing women of using accusations to trash political careers. Me Too, he argues, is “narcissistic” and “modern feminism has taken a dark turn”. He hints at conspiracy theories surrounding Carl Sargeant’s tragic death – while also railing against the fact that ‘hearsay, conjecture and rumour’ is rife in Wales – and takes the side of Brett Kavanaugh when he is of accused of groping after being chosen as a Supreme Court Justice nominee. As someone who writes thoughtfully and sensitively about numerous issues in this book, it’s unfortunate that Aled can’t sympathise with the hurt caused to women by the culture of sexual harassment and sexual assault. But while freely expressing these opinions, Aled also seems oblivious as to the reasons why Ein Gwlad is struggling to attract women to their Steering Committee. “The lack of female input into proceedings was very noticeable and would become a recurrent theme in group discussions over the next few months,” he says. The answer might be that young people and women are very politically active, but not as interested in sitting in a room of white men whose views on women and equality as stuck in the 1980s! As a book, this is a little bit like Ein Gwlad itself, and populist politics as a whole – raw, self-published, engaging, painfully honest at times and vaguely stomach-churning at others. I would suggest that Aled Gwyn Jôb send his work to a professional editor next time. There are frequent typos, a lack of full stops, and shifts from present to past tense here. But the advantage of going straight from personal computer to press is perhaps the freshness of it – much of the book takes place within the last few months. How interesting this book will remain as an account of the first year of a political party surely depends on whether Ein Gwlad sticks around or fade from view. Can an unpolished, fractious, non-PC force such as Ein Gwlad be a success? Five years ago, you would have said no. But these days these qualities almost seem like requirements. It’s hard to argue, given the success that Trump and Brexit have enjoyed, that there isn’t a market for the kind of populist politics Ein Gwlad are offering. Some people will find them a breath of fresh air. Others will be repulsed by them. But that’s politics now.